Yesterday was the 221th anniversary of the Bill of Rights, taught in every school in America. 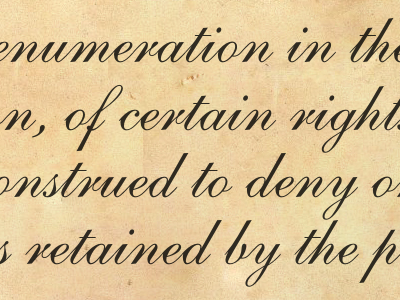 Interestingly, certain rights are not enumerated, and yet people still benefit from them. Madison wasn’t convinced. He called specifying rights a “parchment barrier.” In other words, a Bill of Rights is just dried ink on paper. History has taught us that despots worry more about controlling the military and defeating freedom-loving gun owners than about words on a piece of paper. Ultimately, Madison favored the Bill of Rights. He thought it would be educational and believed breaking the paper barrier might rally revolution against an oppressive government in the future. Jefferson had persuaded Madison it would help make the judicial branch the guardian of individual rights. All these arguments have proven useful to help maintain our liberty. Many of us are familiar with our First Amendment rights. Much political debate surrounds our Second Amendment rights. But few of us ever think about how the Ninth Amendment preserves all of our rights not cited in the Constitution. In some ways it is unfortunate these rights were not specified in the first place. On the other side of the debate, certain benefits claimed to be the rights of every citizen contradict personal liberties. For example, there is no right to health insurance because that would curtail the freedom of all citizens by burdening them to pay for it. Nor is there a right to earn a specific wage regardless of one’s desire to be a poet despite a lack of talent. Rights limit what government can do. They do not burden people with things they must do. What are some examples of these unenumerated rights? Some of them were established by Supreme Court rulings in the last 100 years. These include the presumption of innocence in criminal cases, the right to travel within the country and the right to privacy, especially marital privacy. These rights, although never enumerated, have found a home in the Ninth Amendment. But we do not enjoy several rights found in the constitutions of other countries. One such right protects the privacy of personal correspondence. Much of the Patriot Act would be unconstitutional if such a right was specified. Much in the act may be unconstitutional even without such an enumerated right. The right to property is not listed. Therefore we can have a tax on net worth. Perhaps there should be a right to freedom of thought, conscience, religion and belief or at least a right to refuse to kill. That would change the drafting of conscientious objectors. It would also change the situation when nurses and doctors in public facilities are asked to assist in abortions. Perhaps there should be a right to freedom of expression including the freedom to seek, receive and impart information and opinions of any kind in any form. If there were, public university professors would not be fired or demoted when they fail to conform to what their institutions deem the politically correct perspective. Perhaps there should be a right not to be penalized without a law. If there were one, Rick Wagoner, chairman and CEO of General Motors, would not have been fired when the government decided to take over his company. Perhaps all public agents should be held to an accounting. Then we would know where the missing billions of dollars of TARP money went. We would also not need to demand an accounting and audit of the Federal Reserve Board. It would be ours by constitutional right. Perhaps there should be a right to equality under the law. If there were, suggestions of positive discrimination on ethnic grounds would be rejected because they would establish categories of people that would, by birth, enjoy greater rights. Or perhaps there should be a right to equality of taxation. If there were, tax legislation or practices that make some unwarranted differences between citizens would be struck down as unconstitutional. In Virginia we just passed a law that gives veterans and senior citizens preferential property tax treatment. I have nothing against either group, but we left out schoolteachers. All of these freedoms appear in the constitution or bill of rights of other countries. Perhaps my favorite is the freedom of education article in the constitution of the Netherlands. It gives parents the right to determine the education of their children even when the government is paying for it. That is, private vouchers are part of the safeguard included with the public funding of education. Additional rights could include the right to a government that lives within its means–a balanced budget amendment. Or the right to a limited government so government spending can’t exceed a given percentage of the country’s gross domestic product. Or perhaps the right to a stable currency so we aren’t required to pay capital gains on government-created inflation. I hope these ideas surrounding the Ninth Amendment leave you with an idea of how critical it may be to defend our unenumerated rights. Natural Rights: Is the Only Moral Code Legal Entitlement? I’ll pick two issues from the many, right to privacy and right to balanced budget. My libertarian colleague believes part of libertarian ideology is the laissez fair of avoiding too many unenumerated laws. To say that right to privacy is in the “penumbras of the Constitution” is pure hogwash. Second, the right to balanced budget would be a conservative’s example of falling into an unintended consequence. This right would by downward spiraling dissolve the government so fast it would be gone before the end of its first boom bust cycle. I find it interesting that you so precisely describe what rights are and are not; “Rights limit what government can do. They do not burden people with things they must do.”; and then go on to use our “rights” as a way to wish for additional obligations that the government has to us, balancing the budget, this has nothing to do with rights, nor does, stable currency or spending limits. I am well in your camp as to the limits on spending etc as being wise, but they have nothing to do with rights and this article. Then you cite the law in Virginia providing preferential property tax treatment to some favored, or perhaps two groups of citizens that combined form a majority of voters, a law that in its implementation could be construed as to trample on the rights of those citizens excluded. A great point in your article, you just kept writing 8 paragraphs too long!